Is #Freedom251 In Trouble Already? You are here: Home / Tech / News / Is #Freedom251 In Trouble Already? On 17th February 2016 the Defense Minister of India, Manohar Parrikar took the honour of launching India’s most affordable smartphone which costs just Rs 251. Also, Freedom 251 has bagged the title of being the cheapest smartphone in the world. The specification which was announced in the launch event today for the Freedom 251 were quite alluring and they completely justified a smartphone with a price tag of Rs 251. But, the day is not over yet and the critics have already started to snap some shortcomings in the Freedom 251. Along with praising all the benefits one might enjoy after buying the Freedom 251, we shall also acknowledge the loopholes which have been spotted in the smartphone. 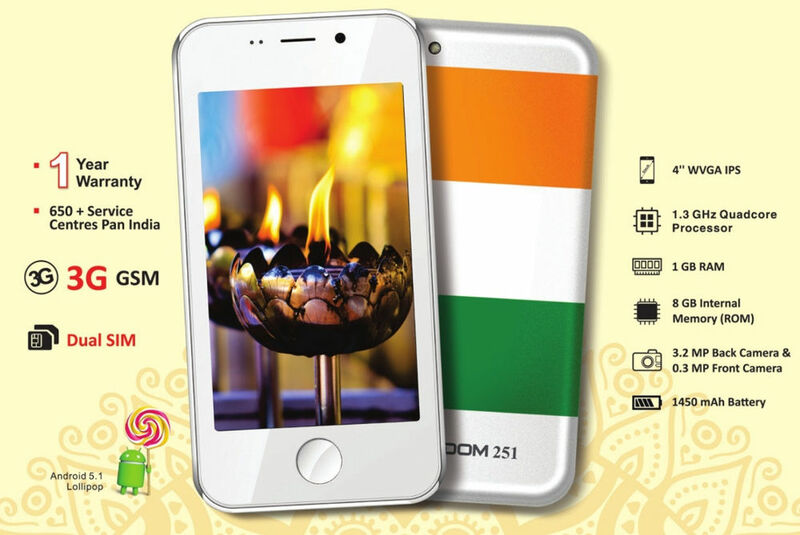 Freedom 251 is a joint venture of the Noida based company, Ringing Bells and the Government of India. The launch even of Freedom 251 was witnessed by many top government officials. The Freedom 251 campaign has taken forward the initiative of the Indian government to make the technology available in the hands of poorest people of India. This initiative will also help in pushing the Indian government’s campaigns like Digital India and Make In India. The smartphone can be purchased by the consumers directly from the official website of the company. But if you’re planning to buy the Freedom 251, let me first list you down with some trouble that Freedom 251 might face in future. 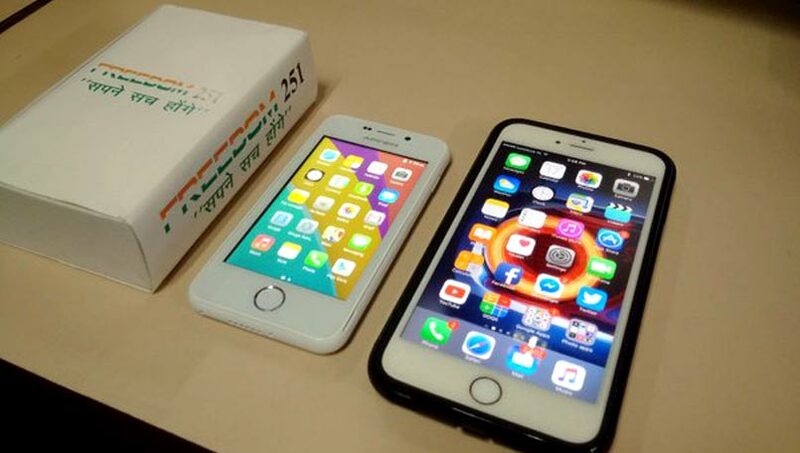 The Freedom 251 is being accused of copying many physical as well as system features of iPhone. Yes, the circular touch at the bottom of the phone resembles as a lot to that in iPhone. 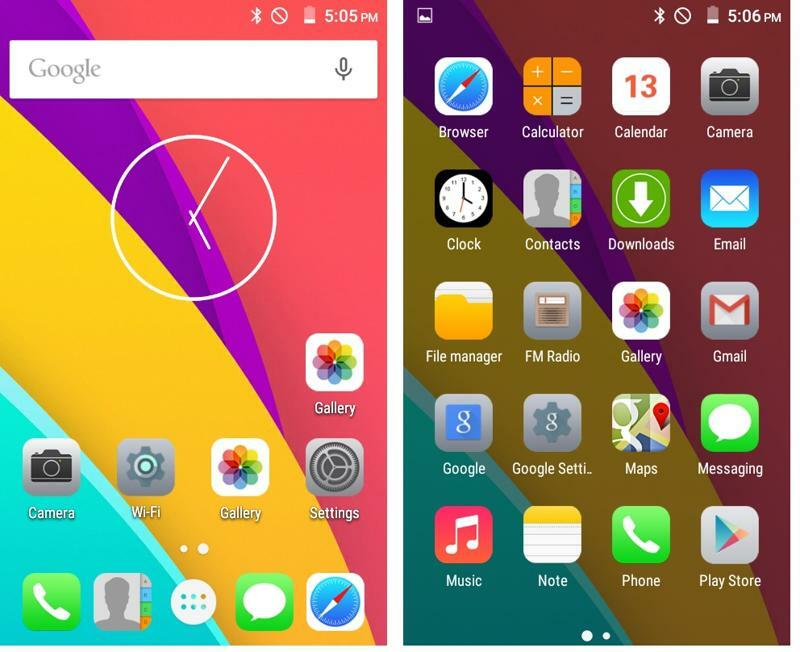 Moreover, the icons in the Menu of the smartphone shows a huge level of similarity with those in an iPhone. Most of the icons like Camera, Browser, Calculator, Clock, Email, Message, etc are an exactly cloned from iOS. A strange fact is that the smartphone launched in the event today nowhere looks similar to the image which was displayed on the company’s official website before the launch. According to a leading news daily, Hindustan Times, the smartphone being launched as Freedom 251, is actually an Adcom branded smartphone. The smartphone, when kept beside an iPhone, finds a huge relevance to it. According to the reports, the Adcom company is completely unaware of their branding being used by the Ringing Bells for their Freedom 251 smartphone. There are also some rumours that the smartphone given to the journalists for review had whitener applied to it in order to hide the Adcom logo. Freedom 251 boasts a lot about promoting the Make In India campaign, but is it even made in India? As we said that the review sample received by journalists had an Adcom logo on it. Now, Adcom is basically is a company based in New Delhi which imports IT products. You can even find these Adcom iKon 4 smartphone being listed on various online eCommerce websites like Amazon, Snapdeal, etc for Rs 4000. This cajoles us to think that the Freedom 251 is just another smartphone whose price is being pulled down to grab the eyeballs. Another constraint which might bind the success of Freedom 251 is the past of India’s technological ventures. Remembering the launch of Aakash tablet, which took off very well but ultimately failed to meet the demands just reminds us of the mess that we have seen. Keeping in mind the price of Freedom 251, the company is sure to get a myriad of orders as this will facilitate an entry of a humongous bunch of population into buying a smartphone who didn’t even think of buying till now. In such a case, it would be interesting to see if the Ringing Bells is able to acknowledge and pacify this huge demand of Freedom 251 smartphone. According to the journalists of Hindustan Times who had received a demo piece of Freedom 251 for review, there were no preloaded apps which were promised by the company like Swacch Bharat Abhiyan App, Women’s Safety App, YouTube, Facebook, etc. An explanation to this by the Ringing Bells was made that these apps would find a way to the one which will be sold to the consumers. But then a question is raised that what was the problem in keeping those apps in the review piece. In fact, including those in the piece which was to be given for review, would have only promoted these apps to the audience. The accusations kept getting stronger when the Indian Cellular Association claimed that a 3G smartphone requires a minimum of Rs 2700 for production and it is just impossible to come up with a smartphone which costs Rs 251. All these ambiguities regarding the Freedom 251 smartphone only signal to take the ship down. But this is not a good news and we hope that the Ringing Bells comes up with a strong counter on the official launch of the Freedom 251. We would also like to communicate that this article are not intended to change your mind on buying the Freedom 251, nor is it to disseminate the negativity about the product. But being a consumer, it is our right be aware of the insights of a product before buying it. Obviously, we would be the happiest citizen of India watching the country progress with the help of more such initiative by the Government of India. And that is why we hope that the Ringing Bells is all set with the answers to the questions of its critics. After all, the Freedom 251, if emerged clean will help a lot to make the smartphones reach in the hands which didn’t even knew what a smartphone is. To those who have any plans to book the Freedom 251, we would flag a green signal as the specifications of the smartphone are quite impressive against its price. The pre-booking for the Freedom 251 starts tomorrow. You can head to the official website which is Freedom251.com and book yourself this world’s cheapest smartphone as soon as the booking starts. Remember, the whole nation has it’s eyes on the Freedom 251, and the servers of the website are most probably to crash down. You might want to be in those first few lucky ones to grab the Freedom 251 smartphone for just Rs 251.